A right-of-way inquiry turned into the latest exhibit at The Falls on the Colorado Museum in Marble Falls: a 125-year-old section of the railroad spur that carried the rock used to build the state Capitol building from Granite Mountain to Austin. The 450-pound section of railroad contains three ties, including an original tie first laid in 1894, several sections of the original steel, and pieces of track marked Carnegie Steel 1902. The 20th century pieces replaced rails worn out by the heavily laden railroad cars during the line’s first eight years. Donated by Capital Metro, the Austin regional transportation agency, the acquisition also came with the original deeds to the land along the rail’s path. Obtaining the 5-foot-by-7-foot section happened almost by accident. Two years ago, a museum visitor asked Oostermeyer if she knew who owned the railroad track to Granite Mountain. She thought it was Capital Metro but decided to find out for sure. When Oostermeyer contacted the real estate division at the transportation agency to confirm that information, she was told Capital Metro was in the process of upgrading some of that older rail line. Oostermeyer wasted no time asking if the museum could have a piece. She got that and more. “My family is the Lacy family that originally owned Granite Mountain, so I’m really interested in this,” Oostermeyer said. Sandoval suggested using the original metal to build a scale model of the track, but Oostermeyer didn’t really want that. She wanted the actual size. Last month, she received a call from the Capital Metro yard in Burnet. The person on the line asked how she wanted it put together for the museum. The final decision was to go for the actual track size. “I had no idea how big this was going to be until I go out to meet the truck,” she said. 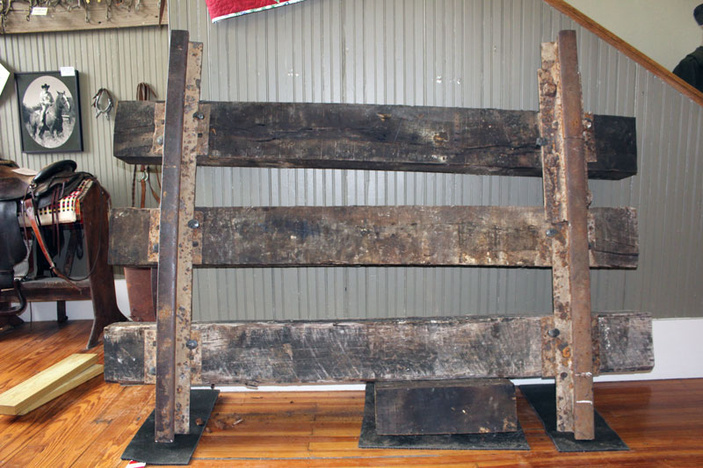 It took four men — with some help from Oostermeyer — to get the 450-pound slice of railroad up the steps of the Old Granite School Building where the museum is located and into the hallway. A few days later, another four men came to help move it from one side of hallway to the other; it needed to be up against a concrete wall for better support. This extra slice of history joins an impressive collection of Granite Mountain memorabilia, including a ball and chain used to constrain the convicts brought in to mine the granite. A small 80-pound water trough carved out of limestone sits next to the railroad section. Convicts dipped gourds into the trough for drinks. “This is going to become a nice little corner of the museum about the railroad and how important it was to this neck of the woods,” Oostermeyer said. The exhibit is now ready for viewing at The Falls on the Colorado Museum, 2001 Broadway in Marble Falls. The museum is open 10 a.m.-4 p.m. Thursday-Saturday. For more information, contact (830) 798-2157 or focmuseumchair@gmail.com.